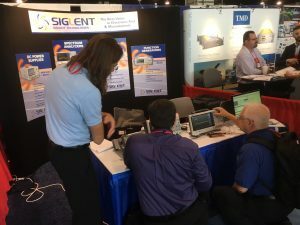 SIGLENT attended North America’s largest Electromagnetic Compatibility and Signal Integrity trade show from August 7 to August 11. Our team demonstrated a number of products designed to help you solve your problems more quickly, including the flexible SSA3000X series spectrum analyzers, SDS2000X series super phosphor oscilloscopes and SDG1000X series function/arbitrary waveform generators. The IEEE EMC show provided a great opportunity to meet with EMC professionals and consultants from around the world and discuss the latest in test technology and solutions.